Can Treatment at a Butalbital Rehab Facility be Effective? Are Butalbital Rehabs Private and Confidential? How Long Does Inpatient Butalbital Rehabilitation Last? A butalbital rehab program is used to help those with addictions and dependencies to butalbital. Butalbital is commonly combined with acetaminophen and caffeine for the treatment of tension headaches. Butalbital is a barbiturate, so the use of this medication can be habit-forming. Tolerance, physical dependency and psychological dependency can occur if the medication is taken for a long period of time or at high doses. According to DailyMed, an average barbiturate dose for an addict is about 1,500 mg.
For more information about butalbital and other barbiturate drugs, contact our 24-hour hotline at 1-888-341-7785. We have the information you need to understand this drug. Inpatient facilities and outpatient butalbital rehabilitation centers can help those with addictions and dependencies to butalbital maintain a drug-free lifestyle. For those with severe addictions, an inpatient program may be the best bet for treatment. These facilities allow patients to live on site with a medical staff available 24 hours per day, seven days a week. Outpatient facilities allow a patient to maintain a normal home or school life. Patients must come in for treatment, but they can live at home and continue with normal day-to-day activities. If you feel that you will not be able to stop taking drugs without the help of 24-hour medical care, a residential rehab program may be your best option. If you are suffering from a severe addiction or dependency or have a high risk because of other mental or physical disabilities, you may wish to participate in an inpatient program. A tolerance occurs when the body gets used to a medication being delivered daily. Over time, a patient will need more of the medication to achieve the same desired effects. A dependency occurs when a patient either physically or emotionally relies on the drug to feel and act normally during the day. Butalbital treatment centers conform to laws that require patients to sign off on the release of confidential files. Any medical treatments are private and secured. The only time a file can be released is during an emergency if it is needed to prevent injury to the patient or others. If you have questions about the butalbital rehab program you're starting and want to make sure you understand your rights, contact our 24-hour hotline at 1-888-341-7785. We can answer any questions you have about your rights as a patient. You may have a private room, but this depends on the facility you enter. Many butalbital rehab programs work with patients living together, which provides peer support, but others, like celebrity rehab centers and CEO treatment centers, provide privacy and security that includes single rooms. If this is a concern you have, talk to your preferred butalbital rehab program about what type of rooming situation you will have. The program you enter will depend on your needs and the severity of your addiction or dependency to this drug. For more information, call us at 1-888-341-7785. Intake is the first step to treatment when you enter the butalbital rehab program. During intake, the clinic will help patients choose a program, determine financial obligations and work on paperwork. The detoxification process is completed after intake. Patients will slowly be tapered off the drug and monitored for symptoms of withdrawal and other side effects. After detoxification, patients start rehab. Behavior therapy, family therapy or group therapy may be started as part of the butalbital rehab program, and many rehab centers offer additional peer support through rooming arrangements, activities and more. For information on the types of payments your butalbital rehab program accepts, call us at 1-888-341-7785. Rehabilitation is important and it can be completed anywhere; however, a change of pace and location can be helpful for some. Some patients feel better when they are not in the same area where they became addicted to a substance, and removing themselves from a bad situation can be another reason for travel. Moving away can be relaxing and it may help the patient focus on healing. Other patients like to live close to their families, peers and friends in the areas where they live. No matter which choice you make, we're here to help. Call our hotline at 1-888-341-7785. When professional concerns are deterring you or someone close to you from getting assistance for a illicit substance use problem or behavior-related addiction, executive rehabilitation treatments will be invaluable. By pairing top illicit substance and behavioral addiction treatments with the freedom of occasional laptop and mobile access, a businessman or woman can achieve recovery while remaining attentive. Frequently, fine substance and behavior treatment facilities feature the nicest amenities you'd expect to enjoy only in exquisite hotels, with your health and well-being being the primary goals. 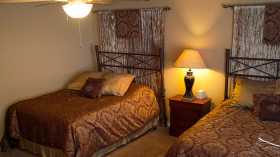 From 5-star chef-prepared meals and fine linens to gym facilities and in-house massage therapy, you can get the top-rated drug, alcohol or behavior treatment for yourself or someone close to you while relaxing in comfort. For support in locating the best-rated luxury treatment programs for Butalbital addiction, call our hotline free of charge as soon as possible at 1-888-341-7785. After rehabilitation, patients who abused butalbital will have the choice of maintaining contact with therapists and doctors who can keep them on the road to a healthy lifestyle. Some patients may move into halfway houses or group living situations. In these homes, the rooms are shared and peers support one another. It is never too early or too late to start a butalbital rehab program. If you or someone you love is ready to start on the road to healthy living, contact us at 1-888-341-7785. It's not too late to stop taking drugs and start living a healthy lifestyle. Call us at 1-888-341-7785 to get the information you need to make a decision that will benefit you. A butalbital rehab program is available for every person, budget and situation, so call us right away; we can help. What are the slang names, street names or nicknames for butalbital? Am I addicted to butalbital? If you find yourself craving butalbital when it is not necessary, taking it more often than prescribed or using butalbital recreationally, you may have a dependency or addiction. Call us to find butalbital rehab program that can help you get sober and healthy. What are the long-term effects of butalbital abuse? The long-term effects of barbiturate abuse can include decreased respiration, slurred speech, memory loss, paranoia and death. At her age it would probably haeppn in a detox unit in a hospital setting. There is no requirement for anyone to go to Rehab after detox unless the person is an offeder and it has been made part of a court order. Detox is the most dangerous stage of getting clean, when people are most vulnerable and therefore open to change, as well as at serious risk of dying alcoholics have to withdraw particularly carefully.